My Victorian caroler is based on the Geisha doll pattern by Laura Lee Ruckle in the April/May 2000 issue of Soft Dolls and Animals magazine. 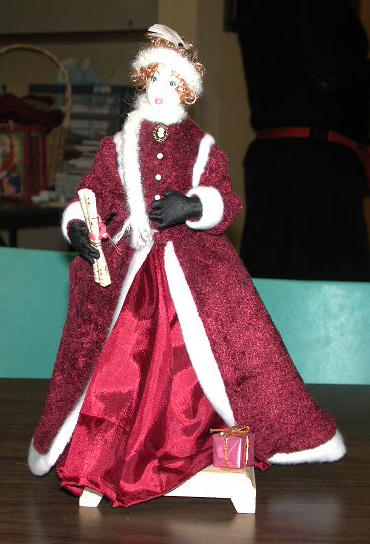 Our doll group had set the theme for the fall 2003 brown bag session as Victorian Christmas. When I was reading through an old issue of Soft Dolls and Animals, I noticed the Geisha pattern and thought she had a particularly Victorian figure. I wanted my doll to be smaller so I photoreduced the pattern. The finished doll is 14" high. When constructing her, I added wired arms and hands to the coathanger wiring of the body and legs suggested in the pattern. Her face was done with coloured pencil. My husband made the stand for her. He changed it somewhat from the original by adding small feet and drilling holes all the way through rather than attaching the wire to screws countersunk in the top. The doll was then passed around amongst other members of the doll guild. Lisa Corr chose the colour scheme and dressed the bottom. Carol Ferguson made the lovely fitted jacket. Sue Leah did the hair and created wonderful little laceup boots. And Barb Lucas made the hairband and scarf and added the music she is holding and the present at her feet. 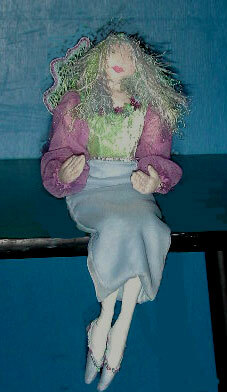 Spring fairy measures 12" high while seated. She is made from Patti Culea's doll #1 reduced to 78%. The edge of her bodice is beaded as are the edges of her slippers. Her wings are bobbin lace using single strands of embroidery thread and blending filaments. To make the wings, I drew the wing shape and then marked in a grid. The outline is done in cloth stitch with a fine wire woven around the outside which makes the wings poseable. The inside is half stitch forming a lattice. She also has epaulets made from bobbin lace hearts.